GET GUARANTEED NATURAL CURE FOR HORMONAL IMBALANCE. WHAT YOU NEED TO KNOW ABOUT HORMONAL IMBALANCE. hormonal imbalance: Women are very familiar with what hormonal changes can feel like. Birth control, your monthly period, or a seismic shift like during pregnancy or menopause can cause physical and emotional symptoms that bear the all too familiar hallmarks of hormonal control. We have seen that a hormonal imbalance can cause symptoms such as unwanted facial hair, acne, excess weight, and more serious conditions including polycystic ovary syndrome (PCOS). There is hope! With just a few key changes in diet and lifestyle, our hormones can get back on track. We’ve got the lowdown on the warning signs of imbalanced hormones and how to bring those hormones back to balance. CAUSES OF BLOCKED HORMONAL IMBALANCE. 1. Gut health: The gut flora plays a role in metabolizing hormones, so gut imbalance or infection can be problematic for hormones. Infection or problems like leaky gut can also cause inflammation and prolonged internal stress, which can overwork the adrenals and cause a cascade of hormonal imbalance. 2. Stress: Prolonged physical or emotional stress encourages high levels of cortisol. This continued high cortisol over a period of time can increase overall inflammation, damage the gut, and cause hormone resistance to other important hormones. 3.Blood sugar: Unstable blood sugar levels can encourage insulin resistance and increase cortisol and inflammation. The blood sugar roller coaster of sugar highs and crashes creates more stress and imbalance in the system, disrupting hormones and energy levels. 4. Detoxification: Once hormones have done their job, it is important for the liver to break them down and eliminate them properly. If hormones are not properly broken down, they can accumulate in the system. This hormone surplus can cause an imbalance and troublesome symptoms. 5. Diet: A diet high in processed and refined foods, inflammatory foods, or foods high in omega-6 can stand between you and healthy hormones. These foods can cause on-going inflammation and stress, affecting cortisol levels and overburdening the liver. Do some of the symptoms above sound familiar to you? Here are some great lifestyle tips to balance your hormones so you can say goodbye to period pains and hormonal imbalance. Adopting a whole foods diet rich in antioxidants, dark, leafy greens, and healthy fats is a must to correct hormonal imbalance. Cut out inflammatory, processed foods and replace with fresh fruits and vegetables, whole grains, lean proteins, and healthy fats. Many women find that eliminating certain foods can also help to keep hormones happy. Dairy is a common offender when it comes to hormonal imbalance. Identifying your personal food triggers with a 21-Day Clean Program is a valuable tool, not only in eliminating irritating food but in supporting proper detoxification of hormones as well. 2. Balance blood sugar: Keeping blood sugar levels balanced is key to bring our hormones back to balance. Swapping high-glycemic foods like refined white flours for complex carbohydrates like whole grains, and including more fresh fruit instead of sugary treats will help to establish more stable blood sugar levels. Relying on long-burning sources of fuel like healthy fats, protein, and fiber and eating regularly throughout the day will also support balanced blood sugar levels. stress on your hormones. And prolonged stress can influence larger hormonal imbalance as cortisol increases inflammation and disrupts the production of hormones like progesterone. Managing stress is necessary to bring hormones back to balance. Incorporating daily practices into your routine like meditation, exercise and self-care are great tools for managing stress. 4. Rest: Sleep is key for recovery and strengthens all efforts with your diet and reducing stress levels. Without enough sleep, cortisol and insulin are negatively impacted which will keep you in the loop of hormonal imbalance. Establish a good sleep routine. Go to sleep and wake up around the same time each day, and allow for 7 or more hours in bed each night. Regular movement will help to sync your cycle. It’s important to find the right kind of movement, avoiding very strenuous exercise. Over training is not good for hormones that are out of whack. Moderate to gentle exercise is usually best, but do it consistently and do it often! The endocrine system is complex, so hormonal imbalance can look different from one person to the next. 1. Sudden or persistent unexplained weight gain: When weight is put on suddenly, or the pounds continue to add on even though you’re exercising and eating clean, hormones may be to blame. Excess estrogen, low thyroid, and insulin resistance in are common culprits of hard to lose weight. 2. Fatigue: Difficulty waking up and feeling exhausted during the day, even after a full night’s sleep, could be a sign of an under-functioning thyroid or adrenals. Having trouble falling asleep or staying asleep is another symptom of hormonal imbalance that can also cause fatigue. 3. Hormonal Acne: Large, painful pimples under the skin along the chin or jawline are a telltale sign of hormonal imbalance. certain kinds of prostaglandins can cause loose bowels, while low thyroid may cause constipation. 5. PMS, mood swings, anxiety or depression: Fluctuations in emotions through the course of a month (or a day!) are normal, but extreme PMS, sudden drastic mood swings, or prolonged anxiety or depression may be a result of hormonal imbalance. AVOID MISTAKES MANY OTHER WOMEN MADE IN CHOOSING THE RIGHT OPTION IN TREATING THEIR HORMONAL IMBALANCE. We have treated a lot of patients with HORMONAL IMBALANCE and they received permanent healing. 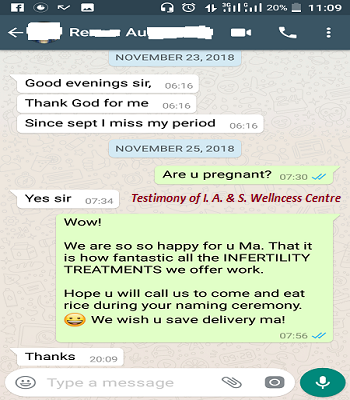 We adopt a natural and non – invasive method of treating HORMONAL IMBALANCE without exposing you to open surgery and without negative side effect. INTRODUCING HORMONAL IMBALANCE NATURAL TREATMENT. PRICE OF HORMONAL IMBALANCE SOLUTION KIT. Category A=N30,000 for a month. It is for mild hormonal imbalance. 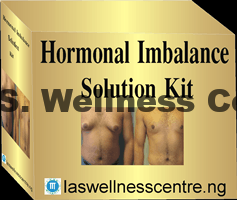 Category B=N50,000 is a complete 2-months hormonal imbalance treatment pack. If you are buying month by month it is N30,000 per month. Please note that at the end of the 1st month the hormones must have been treated but might not be completely balanced. But 2 months will balance it. So, if you are buying 2months treatment pack it will be N50,000. ARE YOU OUTSIDE LAGOS OR NIGERIA?